One Monkey With a Typewriter: Presenting the must-have vintage mobile communications transport device for hipsters! 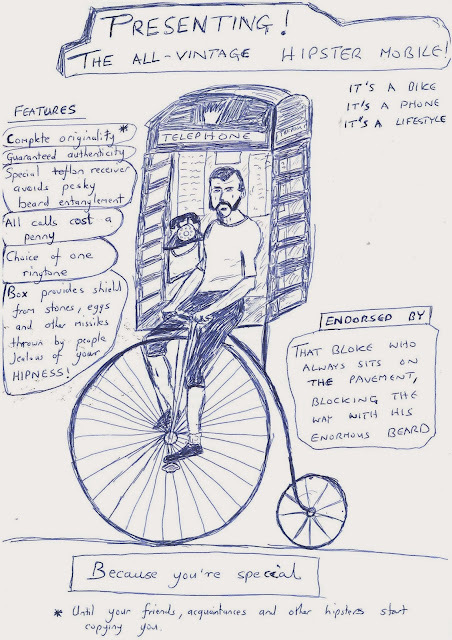 Presenting the must-have vintage mobile communications transport device for hipsters! This weekend, my wife Nats and I were discussing ways to make more money. Well, Nats, I believe I have cracked it. I have yet to set an RRP for this amazing product, but considering house prices in London and the fact this could serve as a mobile home as well as a mobile phone/transport device, I'm thinking of setting the bar as high as the penny farthing upon which it is based.